"Thank you Bianco Smile! My teeth weren't as white as i'd like them to be. With only 1 use of your teeth whitening LED light kit, the results were awesome!" - Sandra Wong (@sj_tam). "I have always been self conscious about the colour of my teeth. Being a regular coffee drinker (about 3 a day), my teeth do stain quite a lot, leaving them looking a little yellow. A friend of mine showed me Bianco Smile Charcoal Powder after seeing it pop up on his Facebook newsfeed. We bought the twin pack, and have not looked back since. My results after a week use are seriously amazing. I'm so happy with how far my teeth have come!" Jackson Bilu. "A fun, simple way to whiten your teeth. Loving my results from my 7 day activated charcoal whitening process. As you can see, most, if not all of the stains have been removed from my teeth - definitely recommend using this product." Peter Fotop. "I'm a self confessed coffee addict so I was regularly seeing yellow tinge stains on my teeth. 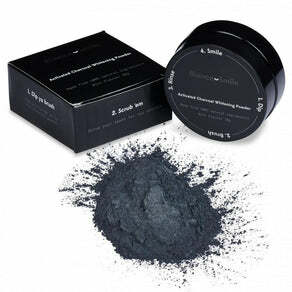 After using the activated charcoal powder every day for 2-3 minutes, within 2-3 days I noticed a massive difference in the colour of my teeth. My teeth are at least 5-6 shades whiter and most stains have now been removed. After 7-8 days of continous use is when I saw the best results. I will be ordering my second jar over the next week or so! Extremely happy so far :)" - Milly Powell. I’m SO happy with my results!!! I used the Whitening Kit as well as the Whitening Strips and after a week I literally couldn’t recognize my teeth! They’re so white! The forming trays that mould to your teeth give better contact and you can add gel to each individual teeth mould which I think is great. I would seriously recommend this product! Thanks guys <3" - Sophie Barbas. "I previously used another brands whitening Kit which made my gums quite sensitive, especially after use. The best thing about the Bianco Smile Whitening Kit is that my gums feel healthy and in no way at all are they irritated after use. I saw instant results even after the first use. Thanks a tone team!" - Stefan Mason.